" ... small sculptures, monumentally big, closed, overflowing with ripe emotion, from inner suffering, from calm consideration-fixed in their simplification of form and full of rich divisions of surface. The nature is simplified as it were and the human body appears protracted and erected in awkward gestures. Yet, what an exceptional rhythm of surfaces and lines-also in the contorted renderings of the body, how this carries out the expression to a high power. Because Minne in no way seeks the "beautiful" line, the balancing equilibrium, the classic beauty and the comfortable admiration. There lies a wonderful, difficult to explain power in the sculptures of Minne-in the kneeling, the left and right stiff bowing figures..." With these words Karel van de Woestijne typified the work of George Minne, undoubtedly one of the most well-known symbolist sculptors in Europe. His modern spirituality, situated on the medieval mythic of Jan van Ruusbroec (1293/94-1381), fit in well with the attempts of the contemporary avant-garde towards what moved the soul. Many admirers in the time see in the stylised art of Minne also a revival of the Gothic. With the strongly implemented simplification and the dramatic rendering of form in a few early works such as Mother Grieving over her Dead Child and The Prodigal Son, Minne simultaneously forms a bridge between the art of the last quarter of the 19th Century and the expressionistic avant-garde of the early 20th Century. The art of Minne perhaps is sprung from isolation, but is related to the contemporary experiments in other lands such as that of Paul Gauguin (1848-1903) and Charles Filiger (1863-1928) in France and Ferdinand Hodler (1853-1918) in Switzerland. Although he remained active until far into the 20th Century, Minne's most original and innovative creations came before 1900. His delicate youthful figures primarily have influence in the years after the turn of the century and in particular on the Austrian painters Gustav Klimt (1862-1918), Egon Schiele (1890-1918) and Oskar Kokoschka (1886-1980) and on the German sculptor Wilhelm Lehmbruck (1881-1919). Most of all in the latter we find Minne's influence on the formal and content level. Minne is known in the first place as sculptor, but in addition to that he is also a draftsman and graphic artist. Like many sculptures of his generation they give their first ideas form on paper. In the medium he finds the possibility to think freely in three dimensions. His sketchbooks provide a good image of the manner in which Minne sought out various positions and thus arrives at their ultimate concept. 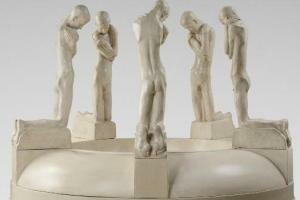 A few stand-alone drawings come about in Minne's most creative years as sculpture, between 1886 and 1900, the majority, however, are from the period during the First World War in the years of exile in Wales. But, also in the stand-alone drawings Minne thinks plastically, and he is in the first place a sculptor. Minne is likewise much less known as a graphic artist. Yet, his illustrations for the works of the Belgian symbolist writers Grégoire Le Roy (1862-1941), Maurice Maeterlinck (1862-1949) and Emile Verhaeren (1855-1916) belong to the most significant examples of Belgian book design of the end of the 19th Century. With simple woodcuts, for which Minne undoubtedly found inspiration in the Middle Ages, he articulates the atmosphere of melancholy and mystique in the verses.